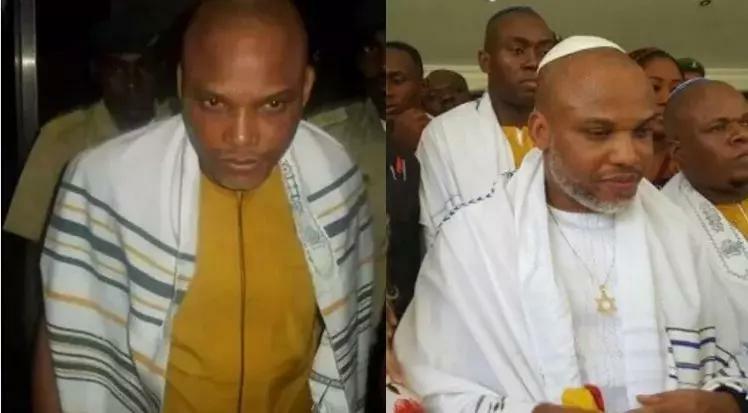 Home EVENTS GOSSIP FINALLY , NNAMDI KANU GAINS FREEDOM, read all you need to know. FINALLY , NNAMDI KANU GAINS FREEDOM, read all you need to know. 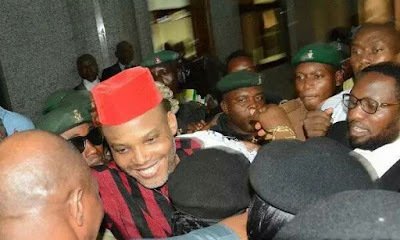 Kanu was seen leaving the prison,He was driven out of the detention facility by former transportation minister Osita Chidoka. Nigerians have taken to various social media platforms to air their views on the subject. Below are what Nigerians are saying regarding Kanu's release. Nnamdi Kanu's wife by name Uchechi Okwu-Kanu says her husband will continue to fight for biafra. the wife of Biafra agitator, Nnamdi Kanu talked also talked about Nigerian civil war and why the agitation for Biafra by her husband and others is important. 1. The war was fought for 2 years, 6 months, 1 week and 2 days. After a hard fought war that led to the death of a lot of Nigerians, the surrender paper was signed on January 14, 1970 in Lagos and the next day it was over. 2. The end of the war came, when the final Nigerian offensive, named "Operation Tail-Wind", was launched on January 7, 1970. The 3rd Marine Commando Division attacked, and was supported by the 1st Infantry division to the north and the 2nd Infantry division to the south. The Biafran town of Owerri fell on January 9, and Uli on January 11. 3. The support of the British was instrumental in the Nigerian victory. The British lent support on December 23, 1969, with a major thrust by the 3rd Marine Commando Division. 4. The Asaba massacres occurred in early October 1967, during the war. It is estimated that more than 700 men and boys were killed, some as young as 12 years old, in addition to many more killed in the preceding days. 47 years after the end of civil war, the Igbos have never stopped demanding for secession, and the agitation is gaining more strength and support everyday. 5. Biafra was formally recognized by Gabon, Haiti, Ivory Coast, Tanzania and Zambia. Other nations which did not give official recognition, but provided support and assistance to included Israel, France, Spain, Portugal, Norway, Rhodesia, South Africa and the Vatican City. 6. In May 1969, Biafrian commandos raided an oil field in Kwale and killed 11 Saipem workers and Agip technicians. They captured three Europeans and then at a nearby Okpai Field Development Biafrian commandos surrounded and captured 15 more expatriate personnel. The captives were: 14 Italians, 3 West Germans and one Lebanese. They were tried by a Biafrian court and sentenced to death for aiding the Nigerian army. However, when the Pope intervened, Ojukwu pardoned and released them. 7. Ethnic Minorities including: Ibibio, Ijaw, Ikwerre, Ogoni and others were suspected of sabotage by the Biafran authorities and subjected to constant surveillance and sifting for saboteurs. This distrust made it difficult for the Biafran state. 8. The Bank of Biafra was created by the Biafran government under "Decree No. 3 of 1967". The bank was administered by a governor and four directors; the first governor, who signed on bank notes, was Sylvester Ugoh. 9. The word Biafra likely comes from the subgroup Biafar or Biafada of the Tenda ethnic group who reside primarily in Guinea-Bissau. Manuel Álvares, a Portuguese Jesuit educator, in his work Ethiopia Minor and a geographical account of the Province of Sierra Leone, writes about the "Biafar heathen" in chapter 13 of his book. Some though believe it is gotten from the words Bay of Ephraim, B'Ephraim as Igbos believe they are descendants of the biblical Ephraim.